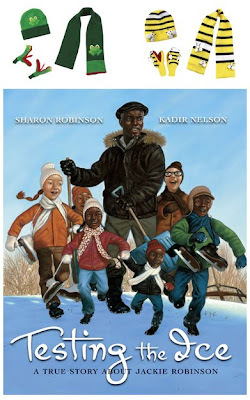 I was recently contacted to review the book Testing the Ice by Sharon Robinson (the daughter of baseball legend Jackie Robinson) and Illustrated by Kadie Nelson. I along with my two teenage daughters read this book individually and shared our thoughts and opinions about it. We all came to the same conclusion that the book was well written and the illustration was beautiful and unique. I really think this book is about bravery and unconditional love of a father. I won't lie, I had tears in the end. This book would be a great asset on any bookshelf and because it is an easy read, it would be great in the elementary school classrooms. It is a big book so you can really see the details in the pictures. Testing the Ice also makes a great gift especially with Holidays coming up. Here is your chance to win your very own copy. Our sponsor has offered one grand prize winner the opportunity to win a copy of the book along with a cute scarf, hat and mittens (no specific color) gift pack. 4 additional readers will win 1 copy of Testing the Ice. *Be sure to have a visible email address in your comment if you do not have a Blogger profile. Giveaway is open to US residents only. Deadline to enter is November 28, 2009 at 11:59 pm EST. Good luck! Special thanks to Scholastic for sponsoring this giveaway and providing Momfiles with a copy of the book. Books Books I love Books! I'd like to give this book to my God-daughter. For now, her mom can read it to her until she's ready to take it on herself. What a wonderful book to read to a child. It gives the child courage to see what is out there in the world and test their "own Ice". I would love to watch this inspiring story with my family. This looks like a neat book to read to my daughter. I would love to share this story with my kids. This looks like a fun book and I believe my kids would love it! They really enjoy reading. Lucky me! lol I would much rather them read than be watching television all day long! I also already follow you on both facebook and twitter. I love reading books to my kids. Sounds very interesting. I checked out the amazon.com link and it says this book is for 4-8 year olds. I would love to get a copy for my daughters. It sounds like a great book. Please enter me in this giveaway. It would be a great addition to our classroom library and Breaking Barriers curriculum we use. I'm glad to see that you and your teenage daughters enjoyed the book, even though it is meant for children. My daughters are ten years apart, 3 and 14, and this would be great for them to read together! I love Kadir Nelson's work -- thanks so much for the chance to win this beautiful book! This sounds like great read! (Though I'd probably end in tears too.) I'd love to share the story with my son. 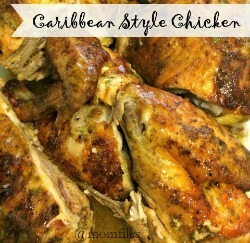 I'm now following on Twitter- www.twitter.com/MommaStaciA. Thanks! I would like to win this for my grandson who is just getting interested in sports. My husband is a big fan of Jackie Robinson, so this would be a doubly great book to have in our reading collection. Oooh, my kids (and I) would love this book. We have such an addiction to all things literary. If I win this prize I will gift it to the battered women's shelter I volunteer with or a child in need on my church's angel tree. This is the season for giving! It sounds like the book would be great for any age. I think my daugther would love it for Christmas. Thanks! We live with snow six months of the year. This would be very much appreciated. This sounds like a great book that I would love to read to my daughter. I absolutely love ice skating! I think it's in part due to the fact that as a child, my father used to "flood" the back yard with the hose as soon as we were at freezing point, creating an ice skating rink for us in our own back yard! We used to have so much fun out there and I'd love to win this book as a reminder of just how much fun ice skating really is! Happy Day After Studffing Day! Sounds like a good way for me to introduce the man Jackie Robinson to my young children. Ver nice illustrations as well. I teach at an after school program and this would be a great addition to the classroom's library! This sounds like a great book for my 9 year old. She is reading books so fast I can hardly keep up. Pretty soon I am going to have to give up trying to preread every book she reads. Thanks for the chance! This looks like an inspiring story - would love to share it with my son. Thanks for the chance to win! Jackie Robinson ia a legend in American Sports History and I would LOVE for my kids to read this great book and learn more about this great man. I would love to add this to our collection.My 4 kids love books.Thanks! This sounds like a fabulous book! Thanks for the contest! We are gearing up for winter. Sounds like it is a good book. My daughter in elementary school would probably like this, as she just went skating for the first time last week. i want to win to give to my cousin, so she can have something new to read to her 3 little ones.